Sensory Integration Disorder, also known as Sensory Processing Dysfunction is a neurological problem that causes difficulty with organizing sensory information for use by the brain. Various conditions can cause sensory dysfunction. In children, we often see sensory integration dysfunction in conjunction with global apraxia (a neurological disorder of motor planning) and autism. Hypersensitivity to touch (also referred to as tactile defensive): the child could pull away from light or unexpected touch anywhere on the body, be unhappy to be cuddled, be distressed with dressing, appear anxious or fearful near people, not accept grooming easily, be picky about clothing materials, overreact to minor injury, be a picky eater, may not walk on grass or sand. Hyposensitivity to touch: the child may bump into things often and not show any pain response, enjoy crashing into things, push his or her body into others, not be bothered by injuries, may show no awareness of cleanliness, may injure oneself purposely with banging head or biting, may injure others with aggressive behavior, seek out messy play activities. Hypersensitivity to movement: the child may avoid the playground, express excessive fear of falling or being injured, cling to others, avoid risks, seem weak, not enjoy turning upside down or rough play, avoid swings, prefers to sit. Hyposensitivity to movement: this child seeks thrilling movement such as the roller coaster, loves being tossed in the air, turns upside down and spins, constantly in motion and can’t sit still. Treatment involves providing therapeutic activities incrementally to regulate the child’s sensory system. At Baron Therapy Services, LLC, our occupational therapists understand the depth at which a sensory disorder can impact the lives of children. Through exploration within our sensory gym, children work closely with the therapist to bring hyper responses down to acceptance, and hypo responses up to require less input. Treatment is systematic and meets the child where he or she is within the regulation process. Treatment activities for hypersensitive children include exposure to textures, body positions, heights, smells, sounds and so on within a supportive environment. For those that are hyposensitive, heavy movement activities are utilized. 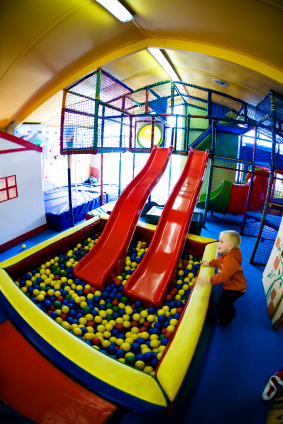 The sensory gym incorporates climbing equipment, sand and water play, the ball pit, slides and swings, balance equipment, trampolines, changing light, extreme height differences, small spaces and large open spaces. The gym holds the sensory input needed for treatment of the full range of sensory integration disorders.If you have further questions, please call to speak with our occupational therapist. We are happy to help!